A road is set to be partially closed for urgent works after problems were found below the surface. The local council said "a major void" had been found under the A4058 in Hopkinstown near Pontypridd by Welsh Water workers. The extent of the problem will be assessed alongside what work is needed. 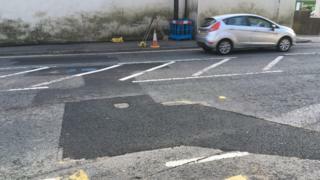 Rhondda Cynon Taf council said one carriageway will remain open, but there was a "significant risk" of a full road closure. A spokesman said that while this could result in "major traffic disruption", it would only be carried out if deemed essential. The council will issue further updates over the weekend.